This show gives a new meaning to the phrase “dark comedy” -slick physical gags and clever, if slightly hammy, characterisations tell a progressively disturbing tale more twisted than Psychoville. The show is tight, pacey and well crafted. The physicality of the two performers is both slick and unrestrained. Their comedic timing is spot on. 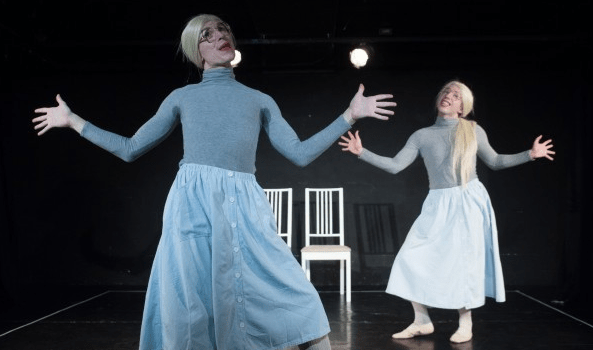 The decision to use two males (Nick Blakely and Carl Harrison), dressed in matching blonde wigs and dresses, was a skilled move in terms of the underlying messages and ambition of the piece. Blakely and Harrison flip easily between characters, as well as playing the two halves of Catherine Pistachio, I’m grateful to director Jen Malarkey for making this choice, it gave Catherine Pistachio a depth, which we wouldn’t have experienced otherwise. The choice to use two males and the the way in which the story was told refracted much of the sentimentality away from the story, it delivered the message in a removed style, and for me the real punch came long after I left the theatre and reflected on the events I’d witnessed. It’s not for the faint hearted – the subject matter, the systematic neglect and abuse of a child, is certainly confronting and the first twenty minutes which reduces the audience to giggling fits at the two comedic performers, builds an unstable foundation which soon topples when the show wrings itself in to something far darker thereon in, with the laughs becoming fewer and farther between. It comments obliquely on the development of the abuse but ended without making any real comment on its consequences, a part of me wanted to see that. Though arguably the point was made through the brutality and bluntness of Jen Malarkey’s direction, and we are able to project those consequences for ourselves. The surreal nature of the show highlights the retreat into fantasy that Catherine uses to escape her abuse and neglect which somehow serves to make the experience all the more disturbing and uncomfortable. We are pushed to laugh as means of dealing with something completely incomprehensible. I went away with the shattering image of Catherine as she stood alone on stage – the internal part of her writhing and breaking, a lingering sense of unease went with me as I left the theatre.